Traverse the summit ridge from the Middle Peak. From the Havelock riverbed, reach Orb Col east of Veil Peak and follow the western slopes of Helmet Peak. Finally, follow the north-west side of the South West Ridge on generally good rock to the southern summit of Trireme. Richard Studholme, Tom Morton, Peter Bain (during a traverse of all three peaks), December 1966 Alternatively, head up Veil Stream and follow the Clover Glacier to the prominent col between the middle peak and Helmet Peak. An easier route may be to climb direct to Orb Col from the junction of Veil Stream and the Havelock River. 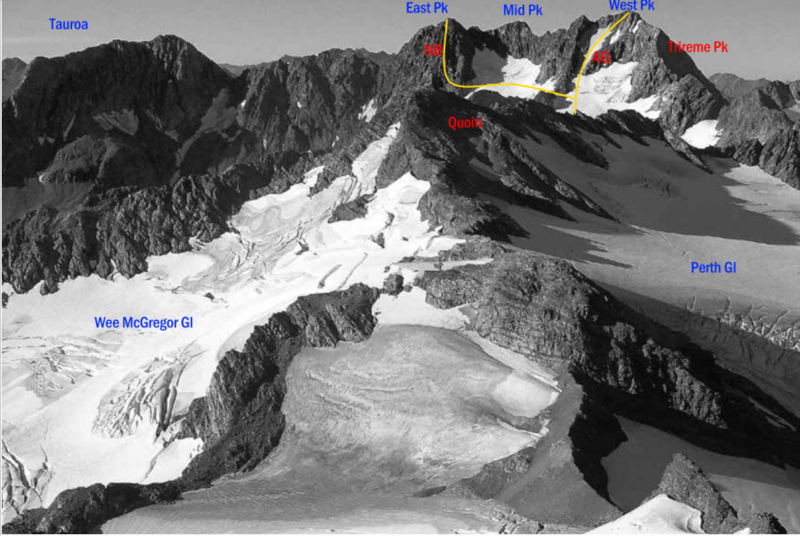 From the col, sidle Helmet Peak on the north and, depending on the conditions, choose a route from the small glacier west of Trireme or follow the South West Ridge. From the upper Agnes Glacier, cross south onto snowfields at the head of Emily Creek. Head due south up reasonably straightforward rock towards the summit.